The Co-op Bank is the first that springs to mind when thinking of ethical banking on the UK High Street. It is the only UK high-street bank with a customer led ethical policy. Global climate change via the extraction or production of fossil fuels. The distribution of those fuels that have a higher global warming impact e.g. tar sands. The unsuitable harvest of natural resources. The manufacturing or transfer of indiscriminate weapons, torture equipment or other equipment that is used in violation of human rights. Irresponsible marketing practices e.g. with regard to tobacco products. These are presented alongside many other ethical principles. The Co-operative Bank has an open and transparent tax policy which is approved by Fair Tax for the year 2017-18. Seeking to support charities and organisations involved in the Social Enterprise sector. Support small businesses and organisations whose activities promote a healthy environment. The Co-operative Bank offsets their operational greenhouse gas emissions, but do not yet report on their financed emissions. 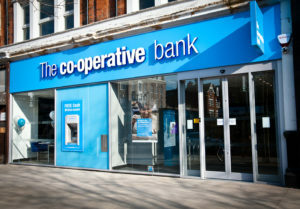 The Co-operative Bank experienced extreme financial trouble in 2013, reporting losses of £600 million. In 2017 it underwent a restructuring leaving the Co-operative Group with a minority stake in the company, with US hedge funds controlling a majority proportion. The bank vowed to maintain an ethical policy even following the acquisition. The Co-op is included in the UK Government run Current Account Switch service, with a guarantee of completion within 7 working days. Current account - overdraft available on request, subject to a credit check. Cashminder - no overdraft available. Everyday Extra - existing customers only, includes Worldwide travel insurance, breakdown cover (UK/Europe) and mobile phone insurance. £15/month. View information on current account applications here. Their Student Current Account is not currently available, but did include a £1,400 interest free overdraft in your 1st year, increasing to £2000 by the third year. This overdraft is free for a year after you finish your studies. View the original Co-op student account here. This may become available again in the future, however we can’t confirm this. The Co-op have a number of savings accounts which range from instant access to children’s savings to ISAs. View them here.